Interested in making money with Google? Here's your complete guide to getting started along with some info on how to maximize your earnings, why some accounts are disabled and even alternative to Adsense. Adsense is a nice way to monetize your traffic, and very easy to implement. Goole.com earns most of its revenue by allowing other websites owner to advertise on their search result pages. All this is managed through a program they call Adwords (pay per click marketing). You see these ads displayed above the free/organic results and along the right side of the page on Google.com. These are called Sponsored Results, and the advertisers are paying a certain amount of money per click for these ads. It's an auction-based system that allows advertisers to compete for those spots. Whomever has the highest bid and most "quality" ad, gets the top spot and so forth. Now you can earn a share of the revenue that Google earns from Adwords by displaying these same text or image ads on your site. When someone clicks, you earn roughly 68% of the click and Google gets the rest. This program is call Adsense. It's a great program that can help you drive additional income to your website, especially if it's mostly content based. So if you are one of those people that doesn't like the idea of paying for a site, this is an excellent way to earn your money back and then some. Please make sure you read this entire article. 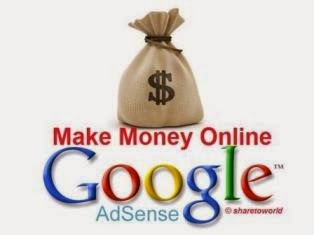 Adsense is not a get-rich-quick scheme and it tales a lot of work to make money. Don't think that just because you join, you are guaranteed to make big money. The commission you receive per click depends on how much advertisers are paying Google for the particular ad. You will earn a share of that amount. It's important to note that we cannot estimate how much you will earn based on your traffic. People always want to know what the average amount is per click. No one knows the answer to this except Google, so don't let anyone try to tell you any different. It would be impossible for myself or any Adsense publisher to give this information because the ads all cost different prices and we have no idea what advertisers are paying. Once you have enough requirements for your site, go to https://www.google.com/adsense to apply. When you are accepted, simply copy and paste the provided HTML code into any page that you'd like to show the ads. You can opt to display text ads, image ads, or a combination of both. It's up to you. You can either display the ads vertically along side the page like Google does or in a banner-like formation horizontally across your pages. You can even customize the colors to match your site's theme. Google doesn't like sites that cover too many different topics because it's hard to target ads. The more focused your content is, the better. There are many questions about why they can't get approved for Adsense. So before you apply to Google Adsense, should read best things to do before applying google adsense or check requirement and program policy for Google Adsense. Recently, a lot of publishers have been getting their accounts disabled for "fraudulent or potential fraudulent click activity". Remember, Google earns most money from advertising. The ads that appear on your pages are costing someone money every single time a click is registered. Google monitors clicks very closely -- especially if your account is NEW. They will disable your account when they confirmed fraudulent clicks for protecting their advertiser's money. Then they refund the advertiser their money -- which is why you don't receive a check for money earned if you are disabled. Find out how THOUSAND of individuals like YOU are making a LIVING online and are living their dreams TODAY.